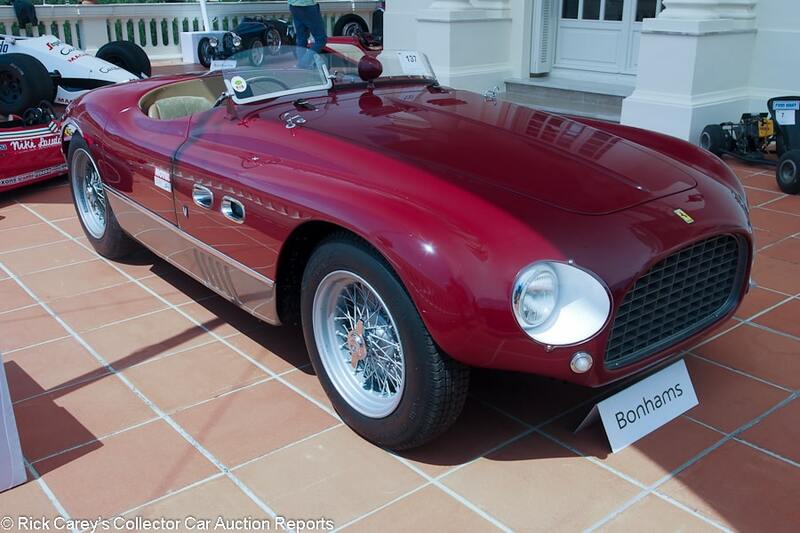 For years Bonhams held its Monaco auction at the Exposition de la Collection de Voitures Anciennes de S.A.S. le Prince de Monaco, a charming and convenient but cramped location in the shadow of the royal palace. That changed in 2018 with the new location at Villa La Vigie. Perched high up on a headland adjacent to the Monte-Carlo Beach Club on the Principality’s eastern margin, Villa La Vigie was built in 1902 by Sir William Ingram, publisher of the ‘Illustrated London News’ and for a decade or so was the Monte Carlo home of fashion legend Karl Lagerfeld. 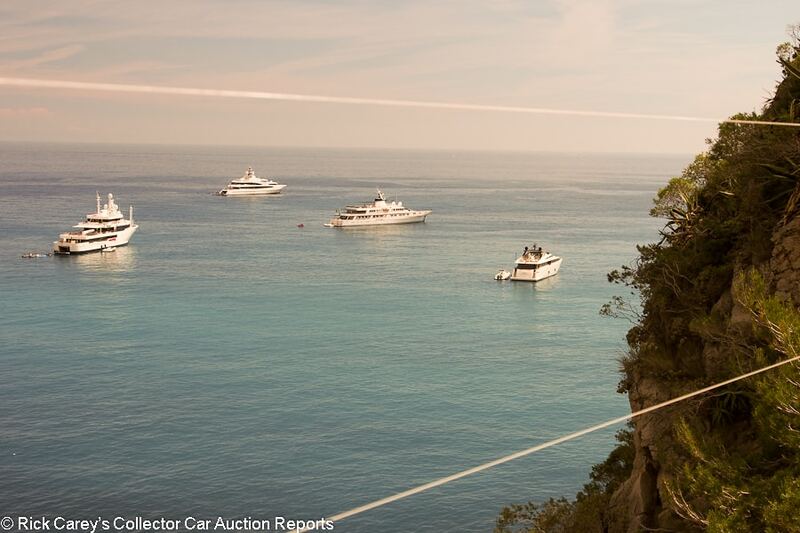 The setting is spectacular, with sweeping views of the Mediterranean and the coast of Monaco and Italy. It also is cramped, with room around the villa for about half the 55 cars in the catalog. The remainder, including several very interesting ones, were parked in a back row of the Beach Club car park, a long and steep hike from the Villa. Apparently getting cars onto the Villa verandah required use of a crane – which I wish had still been in place to hoist visitors to the aerie. A fleet of Mini Mokes or Jollys would have been a good idea to shuttle visitors but other than that it is a spectacular location that fits the ambience of Monaco. 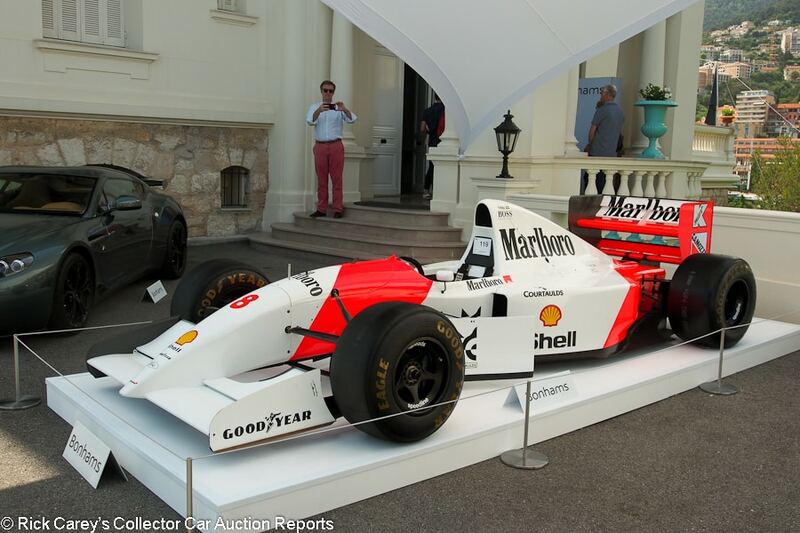 The star of the sale was the ex-Ayrton Senna, Monaco GP-winning, McLaren MP4/8a. It and another Senna car, his 1984 Monaco GP debut Toleman-Hart TG184, both sold for prices that reflected serious premiums for their Ayrton Senna history. The transaction results reported here are modestly ameliorated by the strength of the US$. Results in Euros are therefore, as far as the market is concerned, somewhat stronger than the US$ figures indicate. 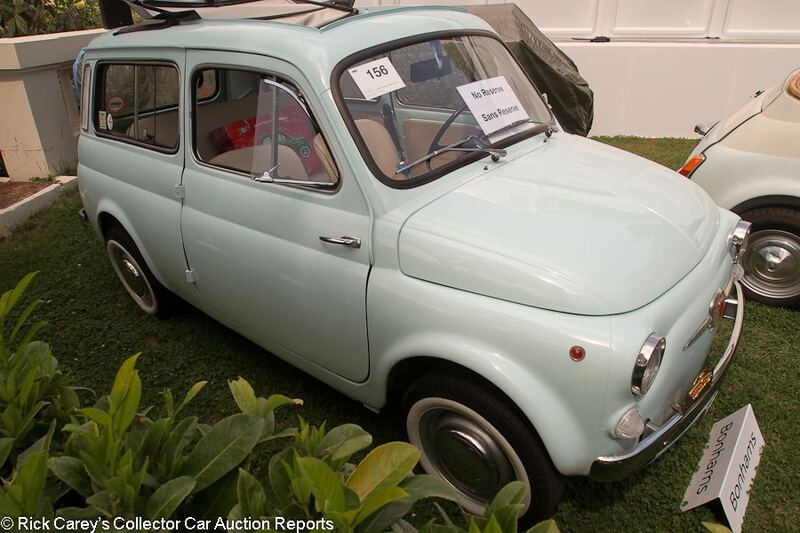 Lot # 101 1970 FIAT 500 ‘Mare’ Beach Car; S/N 2429372; Light Blue, White/Wicker; No top; Estimate $29,878 – $41,829; Cosmetic restoration, 3+ condition; No Reserve; Hammered Sold at $35,853 plus commission of 15.00%; Final Price $41,231. – Wicker seats and wicker-wrapped steering wheel, Abarth cylinder head. – Decent paint, good wicker and carpets. Old underseal in the wheel wells. Orderly engine compartment. 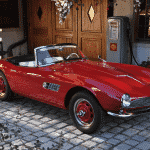 Converted by Carrozzeria Holiday and cosmetically restored in 2014 to good beach car condition. 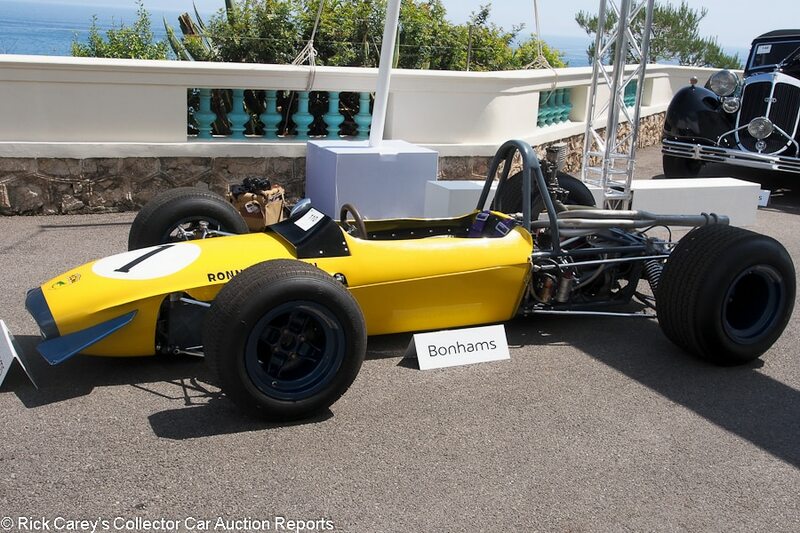 – Nowhere no more appropriate than here in Monaco on the Cote d’Azur on GP Historique weekend and the setting did its part in attracting this enthusiastic price for the first car in Bonhams sale. There were a number of yachts in the harbor at anchor more than big enough to accommodate this cheeky little tender. 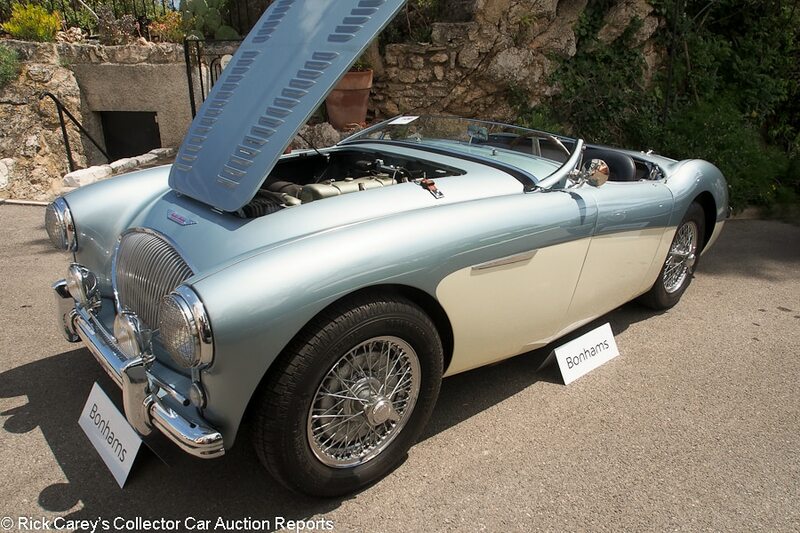 Lot # 109 1956 Austin-Healey 100M ‘Le Mans’ Roadster; S/N BN2L230581; Healey Blue, Old English White/Blue vinyl; Blue vinyl top; Estimate $191,216 – $215,118; Older restoration, 2- condition; With Reserve; Not sold at Hammer bid of $179,265. – Chrome wire wheels, Vredestein tires, Donald Healey woodrim steering wheel, overdrive 4-speed, Lucas fog lights, headlight stoneguards. – A factory-built 100M, BMIHT and 100M Registry documented. Restored in 2009 and showing age with sound older paint, lightly stretched upholstery, dusty underbody from road use. Mostly good chrome with some weak bits on the windshield hinges. – Given the restoration’s age and condition the bid here is appropriate, even with the impressive documentation and factory-built M specification. It is somewhat surprising that the seller didn’t take the money, especially as the relatively strong dollar makes the US$ result seem more modest than it is in Euros. 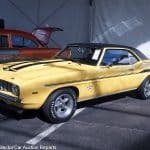 Lot # 110 1969 Tecno-Novamotor Ford 69 Formula 3; S/N TOO334; Yellow/Black vinyl; Estimate $95,608 – $143,412; Competition restoration, 3- condition; With Reserve; Hammered Sold at $95,608 plus commission of 15.00%; Final Price $109,949. – Chrome suspension, VW gearbox with Hewland H6 adapters numbered H6-415, single throat Weber 46IDA2. – Ronnie Peterson’s 1969 Monaco F3 race winner and a total of 16 races that year. Frame is sound and may be newer. Footwell paint is peeling from hydraulic fluid leaks. Rust spots on the chrome and generally dirty. Museum displayed many years in Sweden and rather used before that but sound and all there. – An historic F3 car but one that will take a complete restoration and overhaul to make into a historic race contender. It brought a generous price that only someone old enough to remember Peterson’s prodigious talent should be expected to pay. Lot # 112 1980 BMW M1 Coupe; S/N WB500000094301080; Orange/Black leather, Grey cloth inserts; Estimate $645,354 – $693,158; Unrestored original, 2- condition; With Reserve; Not sold at Hammer bid of $549,746. – Becker Mexico cassette stereo, air conditioning, power windows. – Good original paint and interior consistent with the 62,848 km showing on the odometer. BMW Classic serviced in 2016 and inspected by them for originality and condition. 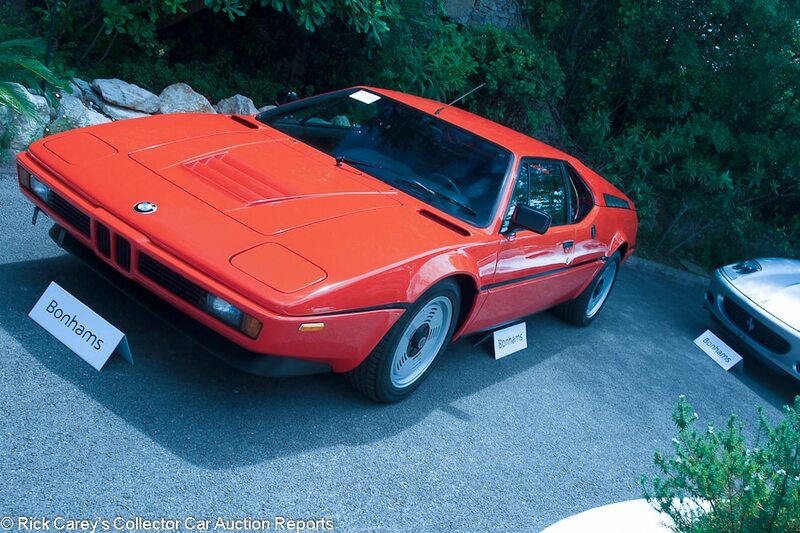 – The originality of this M1 is attractive, but it is hard to see it being attractive enough to be worth much, if any, more than the amount bid here. The estimate range is right, but in US$, not Euros. Lot # 114 1953 Alfa Romeo 1900 Corto Gara Stradale Coupe, Body by Touring; S/N AR1900C01420; Dark Blue/Blue vinyl, Ivory cloth; Estimate $454,138 – $549,746; Older restoration, 2- condition; With Reserve; Hammered Sold at $430,236 plus commission of 15.00%; Final Price $494,771. – 5-speed, Nardi floor shift, chrome wire wheels, Michelin tires, woodrim steering wheel, sliding Plexiglas side windows, Carello headlights. – Very good paint, chrome and upholstery. Sound carpets but none on the transmission tunnel. The aluminum trim on the side windows is starting to oxidize. The underbody has been restored, then driven. The sculpted steering wheel is delectable. According to the catalog, it is one of only three Corto Gara Stradales built out of a total of 11 in all. – Reported sold by RM in Monaco in 2012 for $311,523 (Euros 240,000 at the time), aside from being in very good condition and with attractive coachwork it is eligible for a bucket list of important events where it should outperform the price paid for it here. Due to exchange rate differences this result is 58.8% more dollars than in 2012 but 72.5% more in Euros. Lot # 119 1993 McLaren-Cosworth Ford MP4/8A Formula 1; S/N MP486; Engine # 510; White, Red ‘Marlboro’/Black suede; Estimate on request; Competition restoration, 2 condition; With Reserve; Hammered Sold at $4,362,115 plus commission of 15.00%; Final Price $5,016,433. – Active suspension, Nardi suede rim steering wheel, Speedline wheels. – Ayrton Senna’s 1993 Monaco GP winner, his 6th Monaco win. Later 4th in the French, German and Belgian GPs. Restored like new and race-ready with some age. Fitted with its original Monaco-winning engine and gearbox. Documented by McLaren, owned by McLaren until 2006 with one subsequent owner. Has been started up at McLaren before the auction. 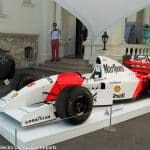 – McLaren F1 cars are rare birds in private collections and this one’s combination of winning Monaco with Ayrton Senna at the wheel is particularly attractive, as is its complete, running condition. It must be worth the price it brought, even if it is $2.5 million less than RM Sotheby’s got for Michael Schumacher’s Monaco-winning F2001 in New York in November. Don’t argue with the people with the money. 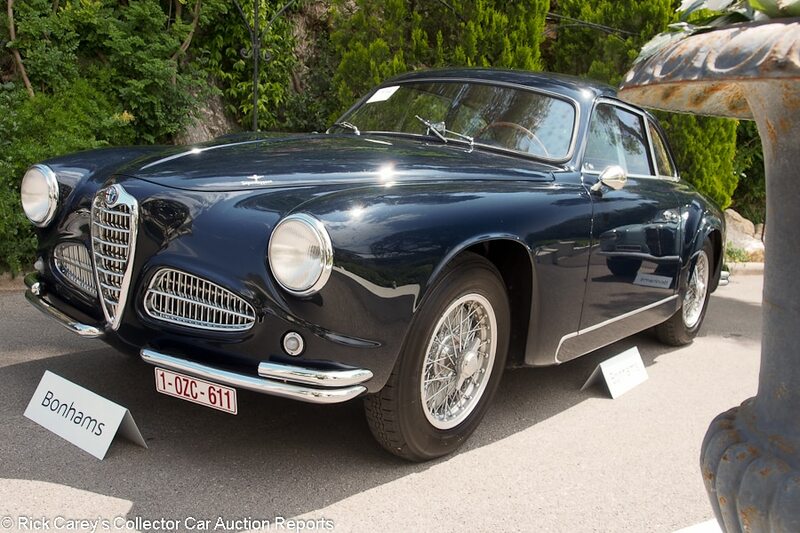 Lot # 120 1956 Lancia Aurelia B24S Convertible; S/N B24S1187; Light Blue/Dark Blue cloth; Estimate $334,628 – $382,432; Older restoration, 3 condition; With Reserve; Hammered Sold at $298,775 plus commission of 15.00%; Final Price $343,591. – Floor shift, woodrim steering wheel, hubcaps, Autovox multiband radio. – Good paint, mixed chrome, lightly soiled upholstery. Cracked steering wheel center cap, oxidized spokes. Filled hole and other patches along the rear margin of the hood. 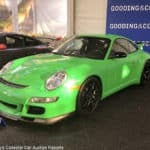 This is a good but not exceptional car that deserved better preparation for the auction. – Appropriately bought for the character and condition of this B24S Convertible, an example of both the auction company and the seller setting reasonable expectations and having them met by the bidders. 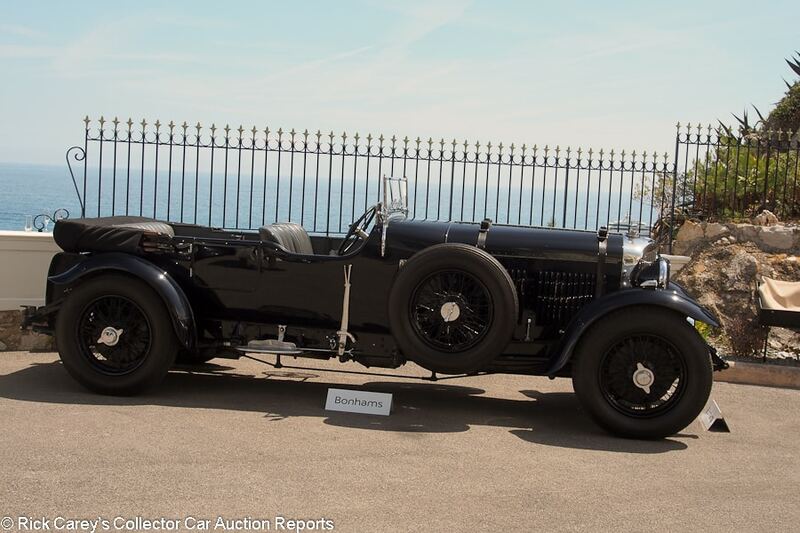 Lot # 123 1931 Bentley 8-Litre Tourer; S/N YR5094; Dark Blue/Grey leather; Black cloth top; Estimate $956,080 – $1,195,100; Rebodied or re-created, 2- condition; With Reserve; Hammered Sold at $770,753 plus commission of 15.00%; Final Price $886,366. – RHD. Body color wire wheels, Michelin tires, dual sidemounts, Lucas headlight and fog light, stoneguards, helmet front and cycle rear fenders. – Originally bodied by Thrupp & Maberly as a limousine, later modified many times until the present 4-seat open tourer coachwork. Very good paint, chrome, upholstery and gauges. Clean, orderly chassis and engine compartment thoroughly detailed after non-negligible road use. Small gouge on the hood’s right side and cracking filler on the left front fender. Handsome and usable while still more than good enough to show after a day’s touring. – Closed post-block with this result, a deft compromise between condition and its much-modified history. It is an immense, powerful automobile that has been thoughtfully rebuilt and upgraded for performance and reliability. 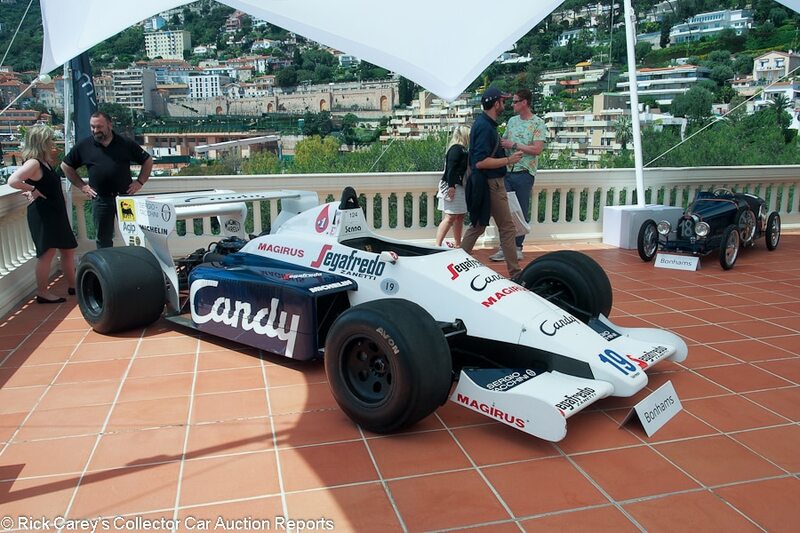 Lot # 124 1984 Toleman-Hart TG184 Formula 1; S/N TG18402; White, Dark Blue ‘Candy’ /; Estimate $896,325 – $1,195,100; Competition car, original as-raced, 3- condition; With Reserve; Hammered Sold at $1,673,140 plus commission of 15.00%; Final Price $1,924,111. – Hart 415-T engine, turbo boost plumbing disconnected to make this a naturally aspirated engine with the turbo (if it works) blowing back into the atmosphere. – Ayrton Senna’s first Monaco GP car, finishing second to Alain Prost in the 31-lap rain-shortened race. Later driven to 7th in Canada and 3rd in Britain and 4th in Italy driven by Stefan Johansson. Dirty safety belts and cockpit. Quick old repaint over old paint, now edge chipped and lightly scratched. Not a reassuring car. – It is a heck of a reassuring price, however, for a car that is probably incapable of running any distance under its own power, if at all, becoming a relic of Ayrton Senna’s first season and the epic (if not for the best reasons) 1984 Monaco GP. 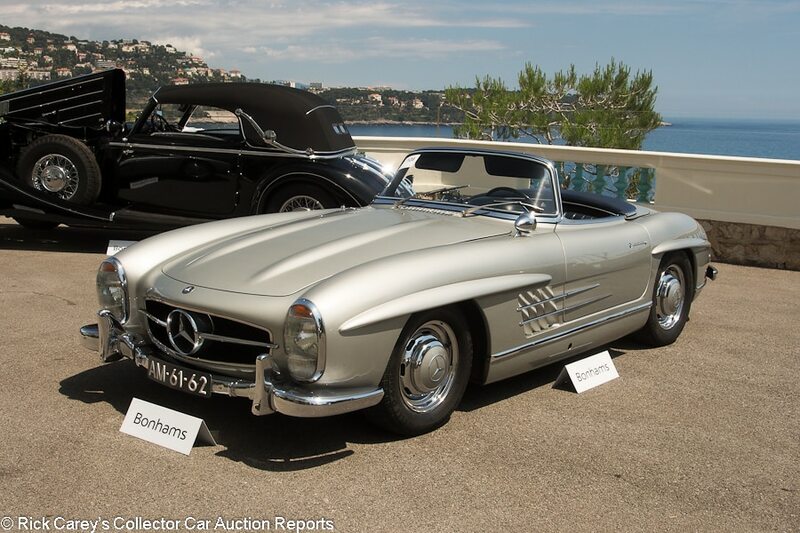 Lot # 128 1957 Mercedes-Benz 300 SL Roadster; S/N 1980427500453; Engine # 1989807500438; Silver-Grey/Blue leather; Blue cloth top; Estimate $1,135,345 – $1,374,365; Older restoration, 3+ condition; With Reserve; Hammered Sold at $1,266,806 plus commission of 15.00%; Final Price $1,456,827. – Chrome wheels, Pirelli P4000 tires, Talbot outside mirror, Becker Europa II radio, Euro headlights. – Very good clearcoat repaint with some small scratches on the nose and the front of the hood. Very good chrome. Lightly creased and stretched upholstery. Crisp, sharp gauges. Dirty underbody and engine compartment from road use. An attractive car but a driver with its 2007 restoration showing its age and miles. – A driver quality car that brought a US$ price that could have bought a much better example, but one that is ideally suited for the many touring events for which it is ideally suited. In today’s Euros it is even more expensive. 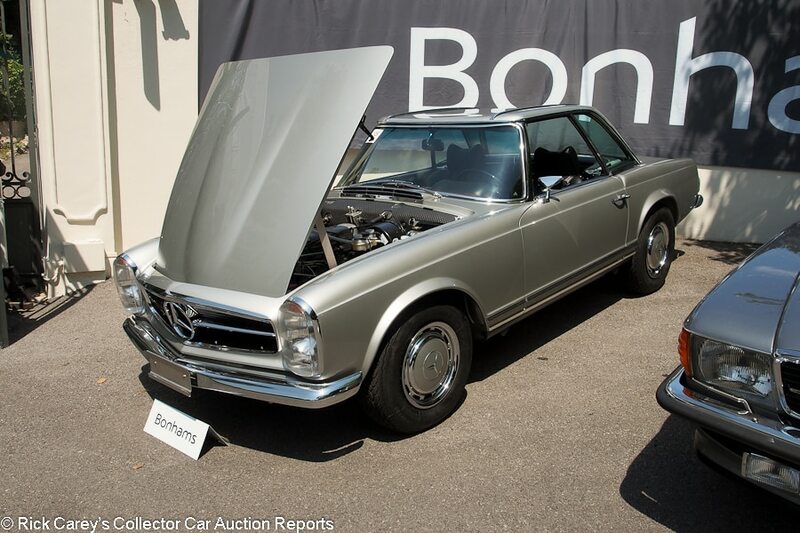 Lot # 129 1967 Mercedes-Benz 280SL Roadster; S/N 11304410000077; Silver, Silver hardtop/Black leather; Estimate $239,020 – $286,824; Recent restoration, 2 condition; With Reserve; Hammered Sold at $239,020 plus commission of 15.00%; Final Price $274,873. – ZF 5-speed, Becker cassette stereo, headrest seats. – 77th built, retained by M-B as a press car, one of only about 300 with the ZF 5-speed. Excellent paint, interior and chrome. The engine compartment is freshly restored and like new, as is the rest of the car. – This is, simply put, a staggering price even for the impeccable quality of the restoration, 5-speed and ex-M-B press fleet history. And that’s even with the relatively healthy dollar holding down the conversion into US$. In Euros this is breathtaking. 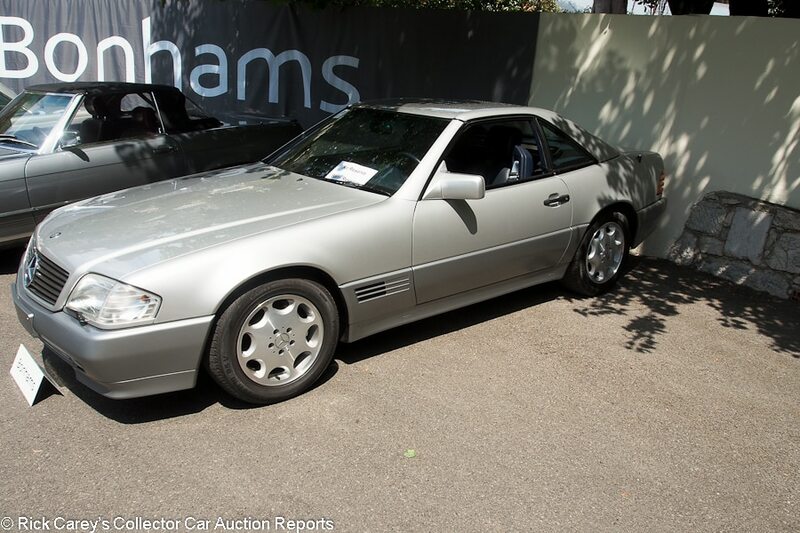 Lot # 131 1993 Mercedes-Benz 500SL Roadster; S/N WDB1290671F087544; Silver, Silver hardtop/Blue leather; Estimate $59,755 – $83,657; Unrestored original, 2 condition; No Reserve; Hammered Sold at $40,633 plus commission of 15.00%; Final Price $46,728. – Both tops, Blaupunkt stereo, alloy wheels, power steering, power brakes, air conditioning, automatic. – 18,097 km from new and looks like it. – This is a used car, even with the low miles, and this is a generous price to pay for it. Lot # 134 1950 Delahaye 135M Cabriolet, Body by Chapron; S/N 801011; Silver/Blue leather; Dark Blue cloth top; Estimate $298,775 – $418,285; Recent restoration, 2+ condition; With Reserve; Hammered Sold at $322,677 plus commission of 15.00%; Final Price $371,079. – RHD. Cotal pre-selector gearbox, triple Solex carbs, chrome wire wheels, banjo spoke steering wheel. – Represented as the original engine. Restored in 2012 and unused since with excellent paint and chrome. The upholstery shows no wear or use at all. The interior wood is richly varnished and the engine compartment is spotless and like new. An outstanding example with attractive Chapron 4-seat coachwork featuring teardrop fenders and headlights recessed into the front fender catwalks. 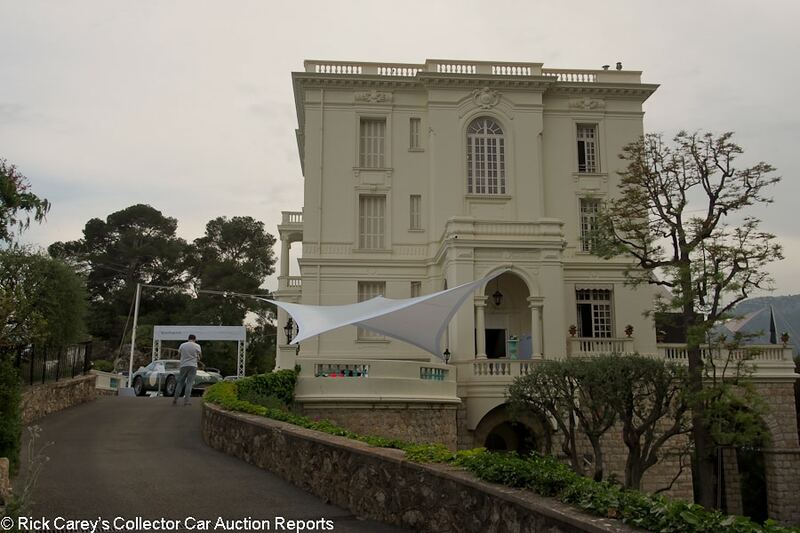 – Even bid well into the pre-sale estimate range the final price, particularly in relatively healthy US$, is still a sound value for an excellent and rare car that would still attract stares of admiration on the Cote d’Azur seven decades after it was built. 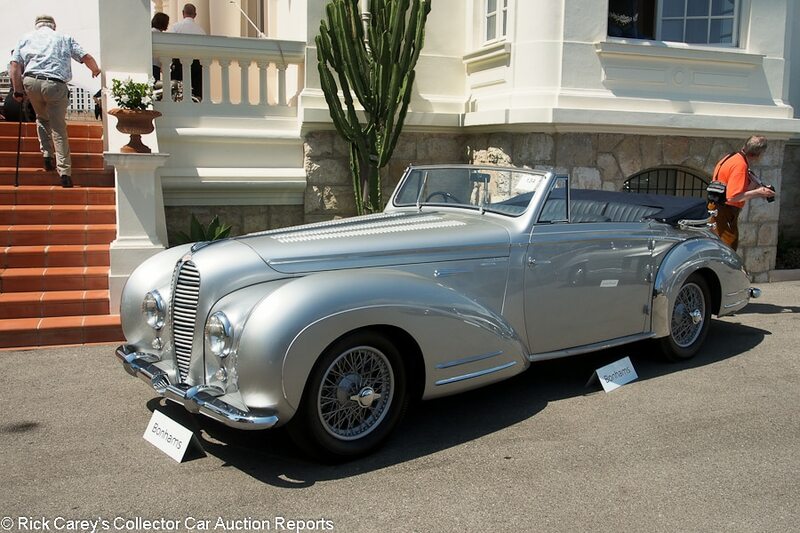 Ferraris and Maseratis are commonplace here in Monaco, but this Delahaye is rare and elegant. 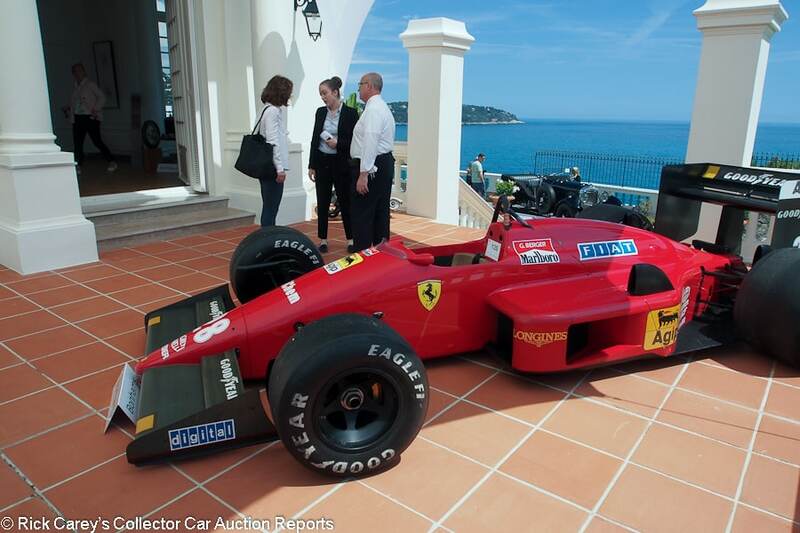 Lot # 135 1987 Ferrari F1/87 Formula 1; S/N 100; Red/Chamois; Estimate $776,815 – $1,015,835; Competition car, original as-raced, 3- condition; With Reserve; Hammered Sold at $692,812 plus commission of 15.00%; Final Price $796,734. – — Michele Alboreto’s 1987 Ferrari team car with indifferent results. Orderly but aged and not cleaned up for the auction with oily road grime all over under the covers. Museum displayed for years and in need of comprehensive overhaul and preparation before it can hope to be run. – The last F1/87 sold at auction was ex-Gerhard Berger s/n 099 at RM’s Maranello auction in 2008 which brought about half as much in US$, a third as much in Euros (247,500) as in this post-block closed transaction. Its 880hp twin turbo 90 degree V-6 is sufficiently complicated that restoration becomes an epic and expensive proposition and it is probably destined to remain an expensive piece of collection art. 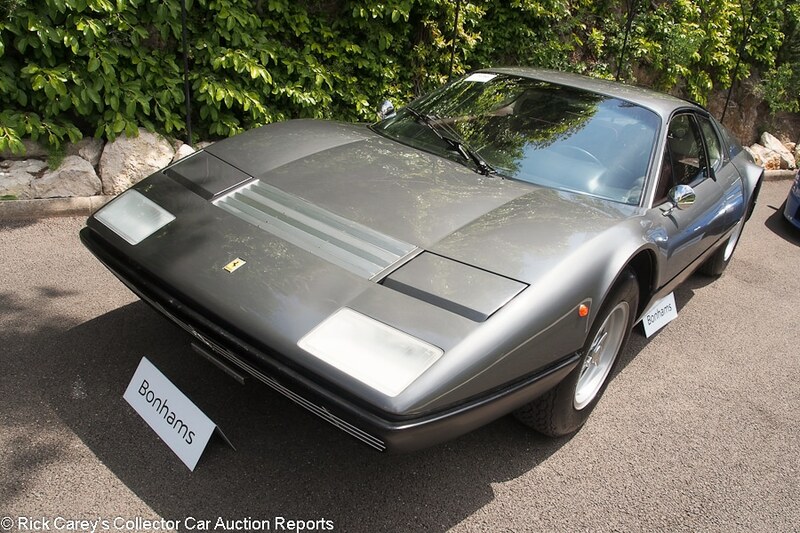 Lot # 136 1974 Ferrari 365 GT4 BB Berlinetta, Body by Pininfarina-Scaglietti; S/N 18041; Grigio Ferro, Black sills/Dark Red leather, Black bars; Estimate $340,604 – $376,457; Visually maintained, largely original, 3+ condition; With Reserve; Hammered Sold at $346,579 plus commission of 15.00%; Final Price $398,566. – 5-spoke centerlock alloy wheels, Michelin tires, Borletti air conditioning, power windows, Voxson 8-track stereo, tools. – Originally a gift from Enzo Ferrari to Peter Schetty, team driver and manager, four owners and 85,199 km from new. Good partially original paint and original interior with a handsome patina. Orderly engine compartment. Thoroughly documented from new. 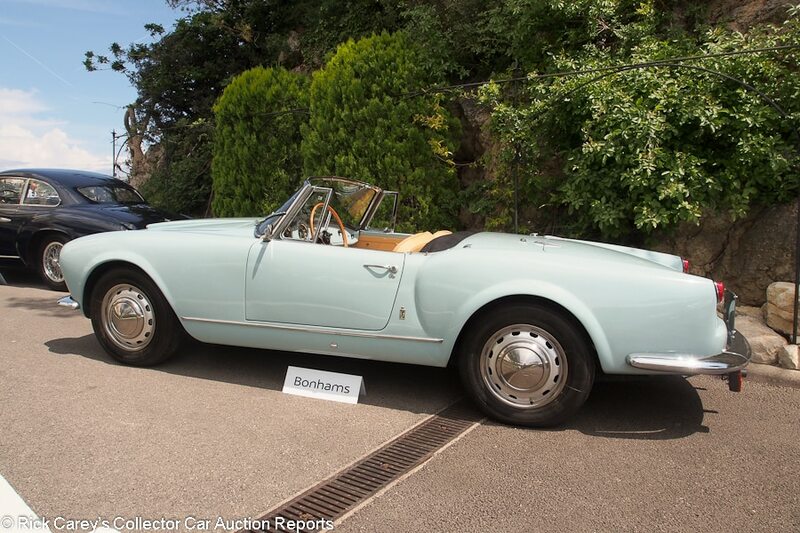 – There is a lot to like about this 365 GT4 BB including its history, known miles, benevolently maintained condition and the color which complements the body’s lines. Then, too, there’s the price it brought, which is a good value considering its many positive attributes. Lot # 137 1953 Ferrari 625 TF Spider, Body by Vignale; S/N 0304TF-0306TF; Engine # N14; Dark Red, Silver sills/Beige leather, corduroy inserts; Estimate $5,377,950 – $7,768,151; Competition restoration, 3+ condition; With Reserve; Not sold at Hammer bid of $4,063,340. – Silver painter Borrani wire wheels, Excelsior tires, alternator, dual aeroscreens, Marchal headlights, 50DCO3 Webers. – Scuderia Ferrari entrant in the 1953 Autodrome Grand Prix at Monza driven by Mike Hawthorn to a 4th place finish then 3rd in the Coppa d’Oro delle Dolomiti by Umberto Maglioli after which it was rebodied by Vignale. 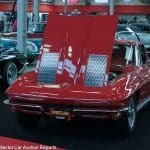 Chassis number changed subsequently, body modified, then sold to Luis Milan in Argentina and raced there into the 60’s. Restored in Italy in the 80’s with a 555F1 engine and regularly historic raced since. Good repaint with small sand chips on the nose. The engine compartment, chassis and underbody have been restored to historic competition standards, then competed. The upholstery shows similar age and use. The alternator is appropriate to the car’s purpose but not authentic. 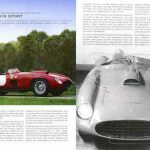 – This is a confused history at best but one typical of Ferraris of the period. The twists and turns of its history relate to the amount offered for it here, but don’t adequately account for its dynamic Vignale coachwork, its performance or its eligibility for just about anything a new owner could want to do with it. Even if it might not bring the pre-sale low estimate it is worth more than the amount bid for it here. Lot # 143 2013 Aston Martin V12 Zagato Coupe; S/N SCFGBBGF8CGS31157; Alloro Green Metallic/Sahara Tan leather; Estimate $657,305 – $896,325; Unrestored original, 2- condition; With Reserve; Not sold at Hammer bid of $549,746. – Carbon fiber wing, taillights and diffuser, 6-speed, Black 19 inch alloy wheels, carbon brake discs. – Lightly creased driver’s seat cushion, otherwise nearly like new appropriate to the 20,800 km it is stated to have covered. Several small chips on the right front fender and on the nose and headlight covers. Road grimy wheelwells and chassis. – One of 61 built and impeccably maintained and preserved, this result is substantially more than the original GBP 330,000 list price, even if it wasn’t enough to pry it from its owner’s hands. 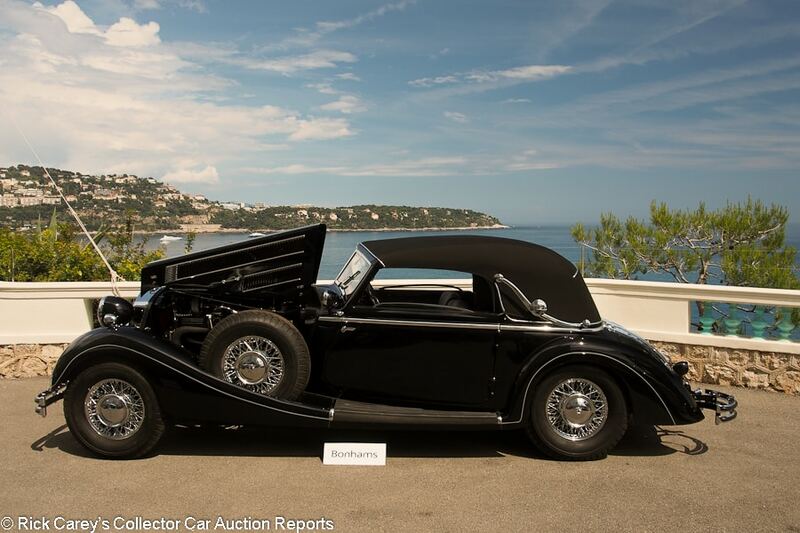 Lot # 146 1939 Horch 853a Sportcabriolet; S/N 854375; Black/Grey leather, Black piping; Black cloth top; Estimate $478,040 – $717,060; Rebodied or re-created, 1 condition; With Reserve; Hammered Sold at $406,334 plus commission of 15.00%; Final Price $467,284. – Chrome wire wheels, Bosch driving light, spotlight/mirror, Horch headlight lenses, Getrag 5-speed. 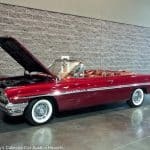 – Excellent fresh paint, chrome, upholstery interior wood trim and top. Gorgeous like new engine compartment. A fresh concours quality restoration that took a derelict car with a rotten body through a six-year restoration completed last year with only a little dust to show that it wasn’t done yesterday. New body framing and panels, Getrag 5-speed, power steering and stainless steel exhaust added. – Offered by Bonhams at the Grand Palais in Paris three months ago where it was reported bid to $611,900 (Euros 500,000), the estimate here is sharply realigned. This result is an even more dramatic contrast that places the nearly completely rebuilt Horch in perspective. There are many original parts but even those are completely reconstructed and all of what is visible is a reconstruction of what Horch built in 1939. Precisely done and meticulously reconstructed from a few remaining parts and drawings, it is a manifestation of something nearly lost to the earth and resurrected. On the other hand, being practical, it is a magnificent automobile with many possibilities. 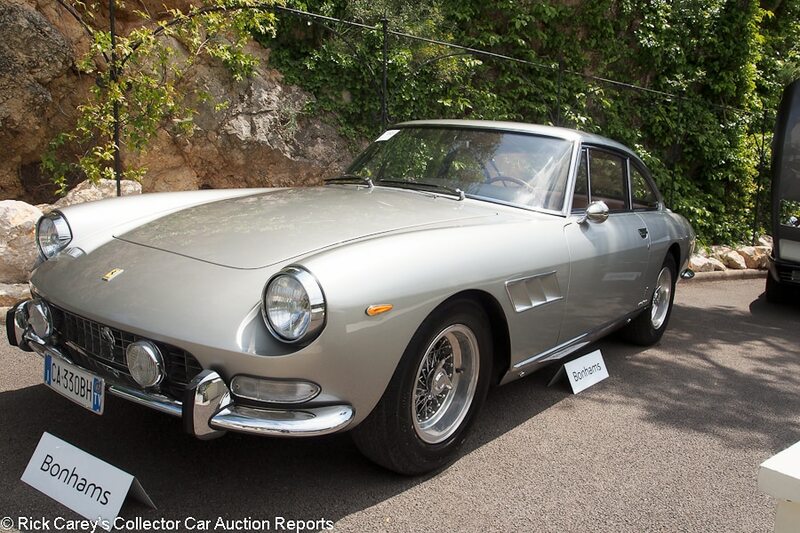 Lot # 153 1967 Ferrari 330 GT 2+2 SII, Body by Pininfarina; S/N 9793; Silver/Beige leather; Estimate $227,069 – $286,824; Older restoration, 3+ condition; With Reserve; Hammered Sold at $227,069 plus commission of 15.00%; Final Price $261,129. – Chrome spoke Borrani wire wheels, grille-mounted fog lights, power windows – Good older paint, chrome and interior. Restored two decades ago in the original colors and thoughtfully preserved with little evidence of wear or use beyond light stretching of the seat cushions’ upholstery. – This result is spot on the money for the age of the restoration and long period of dormancy that probably will entail further work beyond the recent recommissioning and fuel system flush. 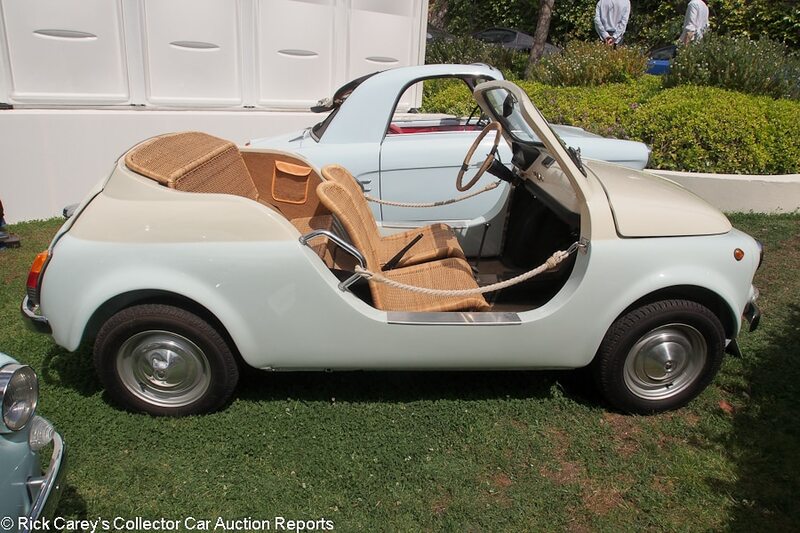 Lot # 156 1971 FIAT/Autobianchi 500 Giardiniera; S/N 120273308; Light Blue/Beige vinyl, Blue piping; Estimate $15,536 – $21,512; Visually maintained, largely original, 3+ condition; No Reserve; Hammered Sold at $10,158 plus commission of 15.00%; Final Price $11,682. 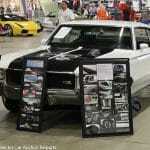 – Black vinyl folding full length sunroof, hubcaps, whitewall tires. – Generally sound paint with minor surface rust on and around the hinges. Sound upholstery. A cute little wagon represented to have been serviced last year but not used much before that. – This is a very good value in a fun, affordable and even practical FIAT with room for kids and dogs.